It was great to see Aidan O’Brien beat the world record for Group1 races won, in last week’s Racing Post Trophy, particularly as he achieved the record with Oddsguru’s selection, Saxon Hero. Aidan’s horse looked in trouble when Roaring Lion challenged and headed him at the furlong marker, but despite the Gosden horse doing himself no favours by hanging badly, I felt that Saxon Hero showed his class, quickening again, and was comfortably in charge at the line. The son of the fabulous Japanese stallion, Deep Impact, he is favourite for next year’s Derby, but as his dam, Multiply, was best at a mile, breeding would suggest that ten furlongs might prove to be the colt’s optimum trip and for those thinking of having an antepost bet, a waiting brief is advised. Saturday’s Charlie Hall Chase, run over three miles with eighteen fences in the way, presents an entirely different challenge, but has attracted some of the best exponents of “The Winter Game” around, including the 2015 Cheltenham Gold Cup winner Coneygree and the evergreen veteran, Cue Card. Hopes are high that Coneygree will become the first winner of Cheltenham’s Blue Riband to grace the field since See More Business in 2000, but he does need an easy surface to take part. However with soft in the current going description it is hoped that Malcom Bradstock’s marvellous 10yo will line up on Saturday. He was the first Novice since the Pat Taffe trained Captain Christy in 1974 to win The Gold Cup, and that effort in 2015 was all the more remarkable, as it was only his fifth race over the larger obstacles. Due to injury he has only raced three times since his Cheltenham victory, winning at Sandown in November 2015, finishing third behind Cue Card at Haydock a year later, and showing that there was still plenty left in the locker when only beaten a short head and a length and a half by this year’s Gold Cup winner, Sizing John, and Djakadam, at The Punchestown Festival last April. He was entered for The Kerry National in September so should be pretty straight for this his seasonal debut, and due to the conditions of the race, he receives six pounds from Cue Card so must go there with every chance. It is hard to believe that it will be eight years next March since the evergreen Cue Card won the Festival Bumper at Cheltenham, but Colin Tizzard’s amazing 11yo just keeps on winning, and has amassed an astonishing £1,372,065 in prize money for his lucky connections. He won The Charlie Hall in 2015 but could only manage to finish third to Irish Cavalier, (Oddsguru’s Selection at 16/1) in last years renewal. Although subsequently winning two Grade1 contests, and only beaten a neck in a third, he has a tough looking task on Saturday giving 6lbs to Coneygree. Nigel Twiston-Davies has won this three times, with Tipping Tim in 1992, and twice with Ollie Magern, in 2005 and 2007. He looks to hold a strong hand again this year with last year’s fourth, the 8yo Blaklion, and the two years younger, Bristol De Mai. The former went on to finish an excellent 4th in The Grand National, and as a course and distance winner of a Grade2 Chase, has to be of interest. However he does seem to need a testing surface at three miles, and with little rain in the forecast Nigel’s best chance of bringing the prize home to Naunton for a fourth time would seem to lie with Bristol De Mai. A winner of five of his fourteen chases, he has shown all his best form in his three seasons racing, prior to the big Spring festivals. Last term was no different, and he put up his best performance of the season when winning a 3mile Grade2 Chase at Haydock (soft) off a mark of 154 by 22L and 3 1/2L from Otago Trail, and Bishops road, in January. As the runner up won a Grade2 Sandown Handicap next time out the form looks strong, and despite a couple of subsequent lacklustre attempts by Nigel’s 6yo, I suspect there is plenty more to come from Bristol De Mai, and as one who can go well after a break has to be on the shortlist. Another who can go well fresh, is the Brian Ellison trained Definitly Red, and he was particularly impressive when winning by 14L from The Last Samurai at Doncaster in March. He was subsequently sent off a very well backed 10/1 shot for The Grand National, but was badly hampered at Beechers on the first circuit, and was pulled up. He looked an improved animal in that Doncaster heat, and with a score of a win and a second from his two Wetherby appearances is well worth considering. A winner of seven of his first eight races, including The World Hurdle by 1 1/2L from that marvellous Mare, Annie Power in 2014, great hopes were entertained for Jonjo O’Neill’s 9yo, More Of That. However since his second win in as many races over fences in December 2015 he has failed to get his head in front, and indeed the only slight ray of light in his last six outings, has been his 6th in this year’s Gold Cup, 9 3/4L behind the winner, Sizing John. Pulled up at the last in The Grand National, connections continue to persevere with the 9yo, and it wouldn’t be the biggest surprise, if this once outstanding animal figured at the weekend. Irish Cavalier looks the value in the bet365 Charlie Hall Chase by Oddsguru – Since its inception in 1969, The Charlie Hall Chase boasts an impressive roll of honour which includes four individual Cheltenham Gold Cup winners, Captain Christie, Burrough Hill Lad, Forgive ‘n Forget, and See More Business, (twice). The latter in 2000 was the last of this elite band, and sad to say, with the withdrawal of the 2015 Gold Cup winner, Coneygree, from Saturday’s contest, the score must remain at four. With the benefit of their new state of the art, all weather gallop, the Bradstocks were hopeful of getting their Cheltenham hero, who was the first novice since Captain Christy in 1974 to win The Gold Cup, to the start, but the dry Autumn has defeated them and we must wait until Haydock in three weeks time to see the exciting Coneygree’s return to action. The wonderful Cue Card had gone nearly two years without hitting the back of the net when coming home in front in last year’s renewal, comfortably beating Dynaste. He then went on to record three Grade1 victories and as a result will be carrying the maximum 10lbs penalty on Saturday, leaving him with rather more to do than last year, when un-penalised, he had only 11st in the plate. Carrying the maximum penalty has been a definite negative, with only two managing to do so in the last decade, and indeed last year, of the three carrying the maximum impost, the best any of them could manage was 4th place. However following that unlucky fall in the Gold Cup, Cue Card was very impressive when beating Don Poli, Djakadam and Dynaste at Aintree, and probably had had enough for the season, when finishing 4th at Punchestown in April. The record of older horses is poor, and 10yo’s are 0 from 15 in the last ten years, and indeed only four have prevailed since 1981. However it will come as no great surprise if Colin Tizzard’s hero defies the stats. Watch the 2015 Charlie Hall Chase here. The Rebecca Curtis trained 7yo Irish Cavalier, finished off an otherwise disappointing campaign in great style when taking a highly competitive Punchestown handicap off a mark of 153, last April. Always going well throughout, he took it up after the second last and staying on really well won by 3 3/4L. He has never won beyond 21f but his very talented trainer, whose yard was under a cloud for most of last season, is hopeful that Saturday’s easy 3miles will be within his compass. With the stable in much better form now, plus the evidence of his 5th behind Don Cossack in The Gold Cup, and that strong finish at Punchestown, her optimism may prove well founded. He is the only runner in the field who has had the benefit of a recent run so is well worth considering. It looks as if Virak will be the sole representative from the three times winning stable of Paul Nicholls and this 7yo will have to have improved a fair bit to figure, but coming from this yard that is not impossible. A winner of 4 of his 13 chases, including at Grade2 level, he hasn’t scored since April 2015, and having been beaten by an aggregate of nearly 40 lengths in his last three races is hard to recommend. Second to Cue Card last year, the 10yo Dynaste has been a big disappointment, and hasn’t won since his Grade1 victory at the 2014 Cheltenham Festival. However he has had a wind operation over the summer, and if this previously very talented animal turns up on Saturday (also engaged Ascot), would be worth a second look. Kim Bailey who won this three years ago with the 6yo Henry Topper, runs his Grand National runner up, The Last Samurai. He has had nearly 7 months to recover from his Aintree exertions, and if fit, could have a say on Saturday. As the Bailey team are amongst the winners, and The Last Samurai can go well after a break, the omens look good. He certainly doesn’t need extreme distances to show his best as we saw at Kempton last December when he quickened impressively inside the last furlong to take a 3m Class2 chase, or indeed when winning the 26f Grimthorpe Chase at Doncaster in March. The Philip Hobbs trained Menorah won the 2014 renewal, and though now 11, showed there was plenty of life in the old dog yet when winning a Sandown handicap (22 1/2f) off a mark of 165 last April. He was beaten in his next two races both over further than 3m, and the reality is that he barely gets 24f. Indeed his only win from 11 attempts at the distance was when he won that 2014 renewal, and it’s not impossible, that back on this easy three miles, this grand type could repeat the dose on Saturday. The second Hobbs runner, Sausalito Sunrise went down with all guns blazing in the big (29f) end of season chase at Sandown in April when gallantly failing to give 14lbs and 16lbs to The Young Master and Just a Par off a mark of 159. He is another who can go well after a break, but is probably more effective over further. Trainer Nigel Twiston-Davies reports last season’s RSA hero Blaklion in fine fettle for his seasonal debut, and granted ground no faster than good is an intended runner. If turning up, this tough and talented 7yo could give the Naunton handler his 5th success in the race. Successful twice at Grade2 level over hurdles, despite a blip in his second chase, the next five outings over the larger obstacles have shown him to be a champion in the making. The scintillating win over Shaneshill and More of That in the RSA at the Festival was particularly impressive. Already a course and distance winner at Wetherby he may prove too good for the older brigade at the weekend. David Pipe’s Dynaste ran some great races in defeat last term and is our selection for Saturday’s big one. First run as the Wetherby Pattern Chase in 1969, it assumed it’s present title in 1990 and the roll of honour features some marvellous steeplechasers, including four Cheltenham Gold Cup winners, Davy Lad, Burrough Hill Lad, Forgive’n Forget, and See More Business. Ten pound penalties have to be carried by winners of a Class1 weight for age chase after 30th September 2014, and in the last eight renewals only last years winner, Menorah, has managed to win carrying this maximum impost. This always competitive race is run at a very strong pace putting emphasis on stamina as well as speed, underlined by the fact that nine of the last ten winners had winning form over at least three miles. Probably due to the less demanding nature of the Wetherby fences in recent years, less experienced animals have been making their mark and two six year olds have won two of the last three runnings. Plenty have won this on their seasonal debut so lack of a previous outing is no bar to success. Paul Nicholls has hit the back of the net on three occasions and both Pipe (Our Vic 2006) and Hobbs (Menorah 2014) have both won once. The ten year old Menorah would be a very popular winner if he could repeat last years success, and judged on the way he beat Al Ferof at the end of April in his last race, his chances of doing so are by no means remote. However it is eleven years since a horse older than nine has won and as he is again burdened with the maximum penalty he may find Saturday’s test just beyond him. Aintree hero, Many Clouds who has won first time out for the last two seasons, and only an eight year old, may well have many more big days ahead of him so has to be considered. Having won at Cheltenham in January, serious Gold Cup hopes were entertained only to be dashed by a lacklustre display on the big day. Never able to keep up with the murderous pace set by Coneygree he did stay on to finish sixth, but covered himself in glory four weeks later, when winning the Grand National by 1 3/4L from St Are. He seems to be an out and out stayer and burdened with the maximum penalty, Saturday’s contest is unlikely to play to his strengths. David Pipe’s Dynaste ran some great races in defeat last term, not least when finishing second in the King George VI chase to Silviniaco Conti, with Al Ferof five lengths back in third, and Cue Card another three and a half lengths further behind in fifth. He also got to within 1 1/2L of Many Clouds, whom he meets on 10lbs better terms at the weekend, at Cheltenham at the end of January. The rest of his season was curtailed by injury and by all accounts he was disappointing on his reappearance in a Grade3 hurdle at Auteuil on very soft ground three weeks ago. However he has come on for a run in the past, and following injury too much may not have been expected. Unpenalised on Saturday he is definitely on the short list. 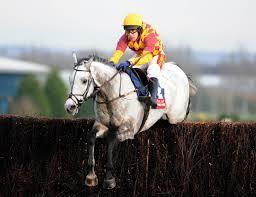 As a 6yo second season chaser, the Rebecca Curtis trained Irish Cavalier is of interest. Having won the novices handicap chase off a mark of 137 at the Cheltenham festival he kept himself busy at the Punchestown equivalent, running twice within three days. Thrown in at the deep end he ran a fine race to finish fourth, beaten less than 4 1/2L by Valseur Lido in the Grade1 novices chase, and again ran well three days later finishing second to Blood Cotillion. Progress had clearly been maintained when comfortably disposing of Henryville on his reappearance at Newton Abbot on October 9th, earning him a new rating of 156. Further improvement is required to win at the weekend but in the hands of his very talented trainer this is more than possible. Cue Card has had a frustrating time since his last win in November 2013. Between stress fractures and breathing problems he has been something of a hospital case, but connections are now hopeful that his problems are behind him, and indeed his last two runs behind Don Cossack in the Spring were more promising. Colin Tizzard reports him to be putting in some sterling work at home, and racing unpenalised it would be no surprise to see him add to his already amazing winnings of nearly three quarters of a million pounds. Having won the race three times Paul Nicholl’s Sam winner is worth a second look as he does seem to run his best races in the first half of the season, and he did win first time out last year. He is saddled with a 10lb penalty for his win at Aintree last December, but coming from this yard it would be no surprise to see him defy it and is another well worth considering.